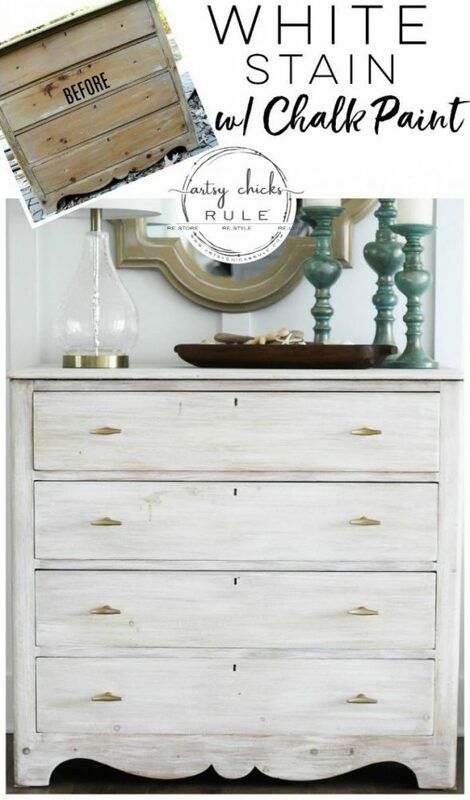 Creating a white stain by using chalk paint makes for a simple application and beautiful look…without all the mess! 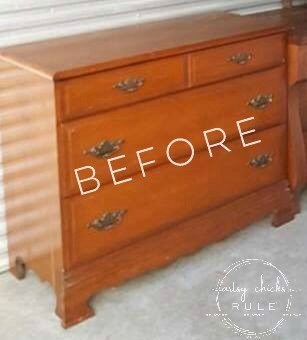 You might remember that I mentioned in this post how I am giving this once made over piece, another makeover! So I gave it one! A brand new look, white stain. And I thought I’d share it today for Trash To Treasure Tuesday with my friends and their treasures. 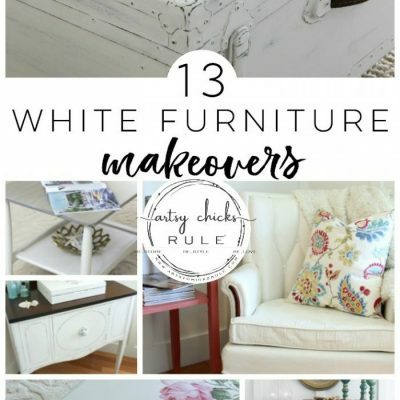 If you are new around here, the first Tuesday of every month, I get together with a few friends and we share our finds that we’ve given a makeover to. Be sure to scroll all the way to the bottom to catch their makeovers, too! And you guys, this piece of mine truly is a treasure to me. It’s not really trash except…it was left behind in a garage in a vacant home so that qualifies, right? Yep! The story behind it is simplistic but hey, what can I say, I’m a huge sentimentalist! 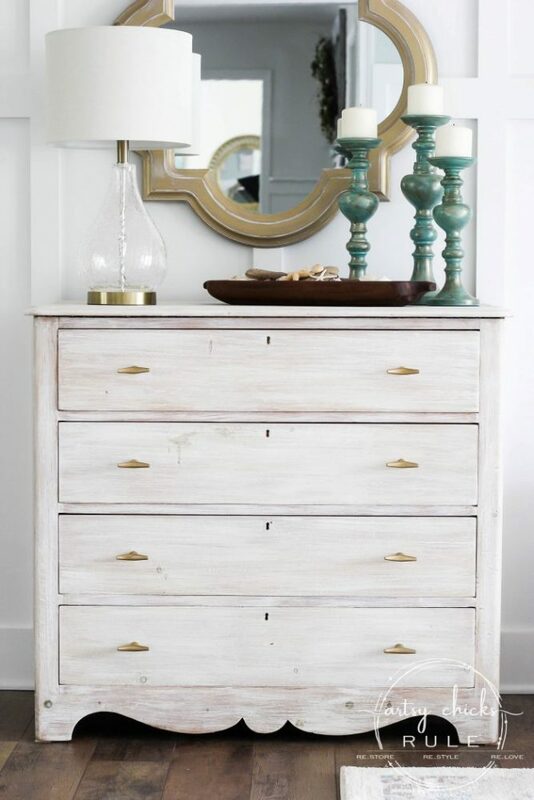 My husband and I got this dresser for free when I was pregnant with our first child. 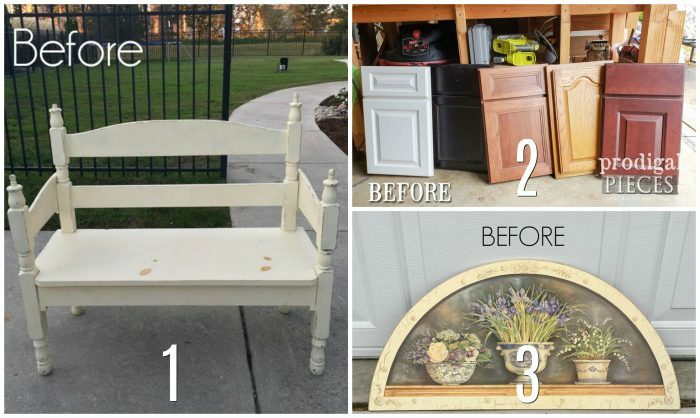 We brought it home and I gave it a mini makeover (a little sanding and a fresh coat of poly). But that was 26 years ago…gasp! Anyway, we used it in our daughter’s nursery and when she was a toddler. Our son came along almost 6 years later and we used it for him as well. So this one has such sweet memories attached to it, I’d never let it go. Once they grew out of it, we’ve used it in our living areas ever since, in one way or another. Here it is at one point…. Ignore the mess. And obviously, this is a photo of a photo but it gives you an idea of how it started. Then I did this to it…. 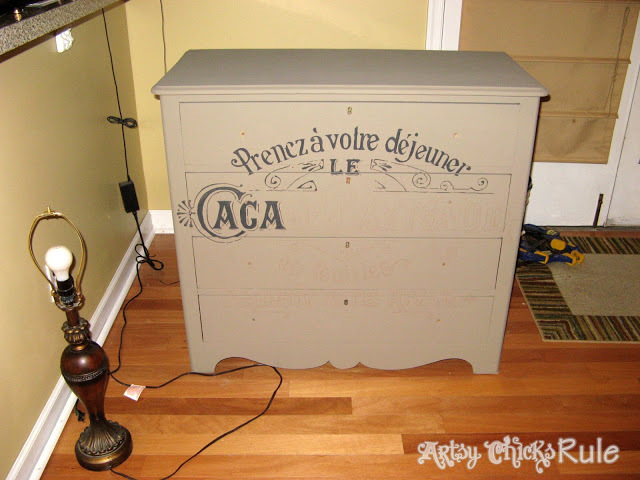 I hand painted the graphic onto the Coco chalk painted dresser. Which then finished up looking like this…. Which I really enjoyed for many years. 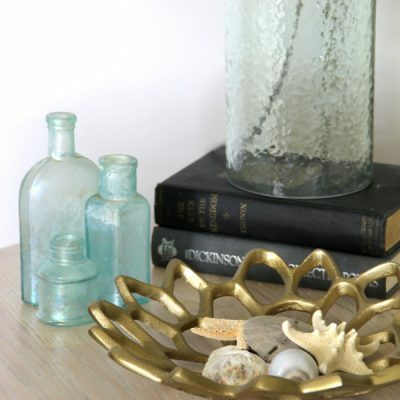 Today my home decor is completely different and this style just didn’t really go anymore. 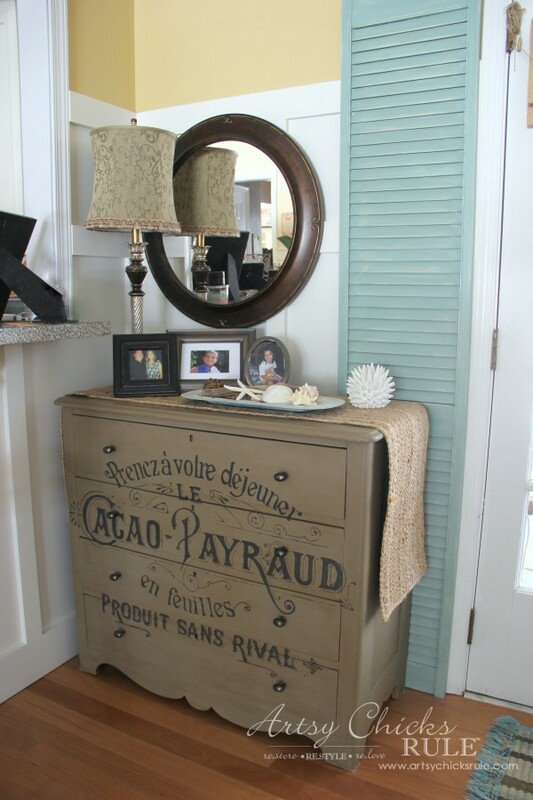 I previously had a French country, coastal cottage look. Now I’m a bit more coastal glam, or that’s what I’m calling it anyway. 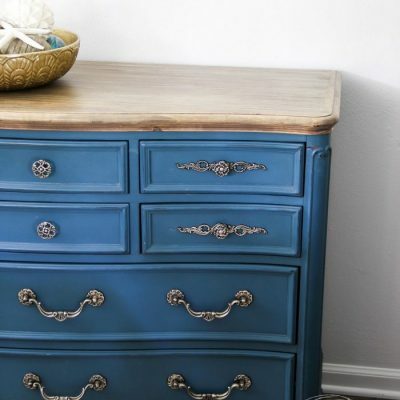 Since the dresser stays, it had to have a makeover. 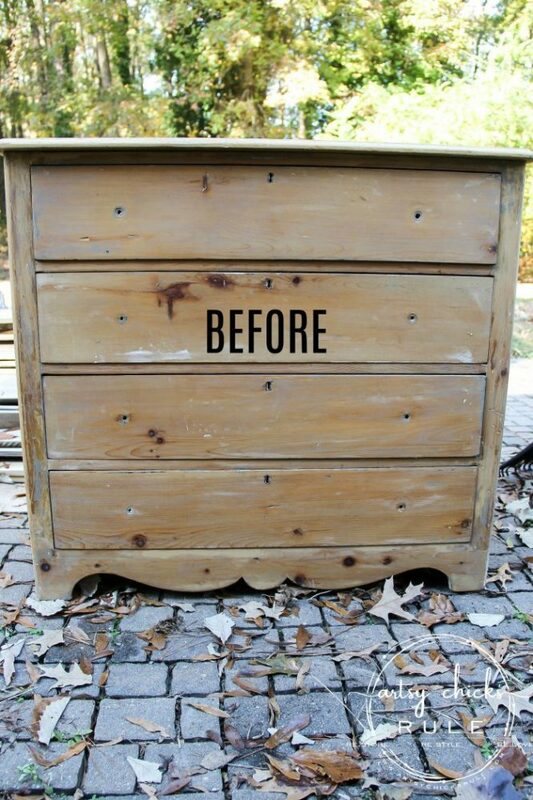 I used my absolute favorite paint remover, Citristrip, to get all the old paint off. I love it because I hate using strong chemicals and this works so well. I did it right inside my house (on a huge tarp, of course) and was done in no time! Came off like a charm. If you follow along with my on Instagram, you might have seen my “stories” on Friday night as I was doing this. I shared a snippet or two. Then on Sunday, I took it outside to lightly sand it all over. You can see it is very rustic looking with all the knots, etc. Once it was sanded (It was freezing, of course! I don’t like working outside in the cold. lol) I brought it back in and got busy with the white stain. 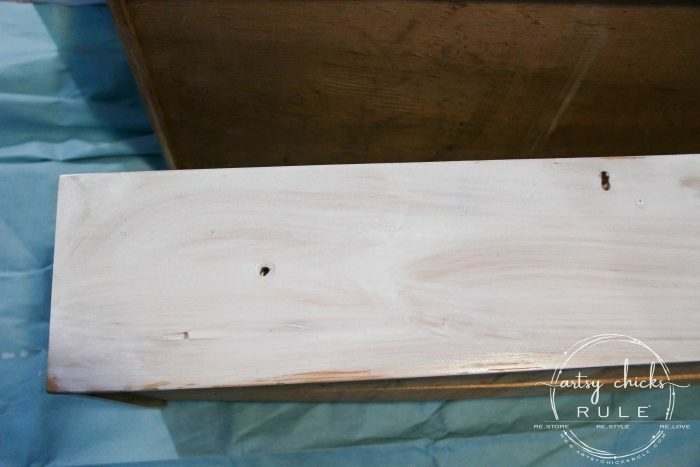 I washed all the wood to remove the sanding dust and then mixed up a somewhat watery mix of paint for the white stain. I used this white paint and water. I applied it with a chip brush all over and then gently wiped it away with a soft rag (like an old t-shirt). 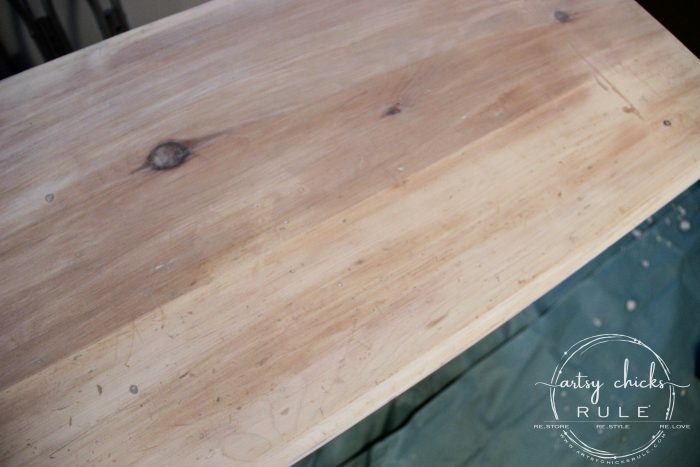 You don’t have to be too perfect here, you just want the white stain to sink into the wood some before you wipe. This wood had so much of it’s own color, I was getting more of a “pickled” look which is fine, but not what I was after. So I let that dry and then I applied another coat. It still wasn’t white enough for me so I added some “dry” brushing over the whole thing. Dry is in quotations because it wasn’t really dry this time but I did it in the same manner as I usually dry brush. Only, I used the watered down paint. I did it this way so I wouldn’t apply too much paint. After that, I decided I wanted it a little whiter still. I’m sorry if that all sounds confusing! That’s how it goes sometimes when things don’t immediately turn out like you plan. You just have to keep going, keep adding, etc. If I completely lost you and you have any questions, just ask me below. That sweet wood bowl was hand carved by an elderly gentleman that I found at a market. He had such beautiful pieces and he loved to tell you how he made his wares. And I loved to listen. So of course, I had to bring something home with me. Yes, I could have gotten something similar (and have) from TJ Maxx, or the like, for probably less than half what I paid. But this is SO special to me. Every time I see it, I smile at the thought of the pride this man had in his work and the love he put into his pieces. A treasured piece, for sure. Okay, back to the dresser. Once that was all done and dry, I tried out this top coat. I’ll let you know how it holds up and if I like it. 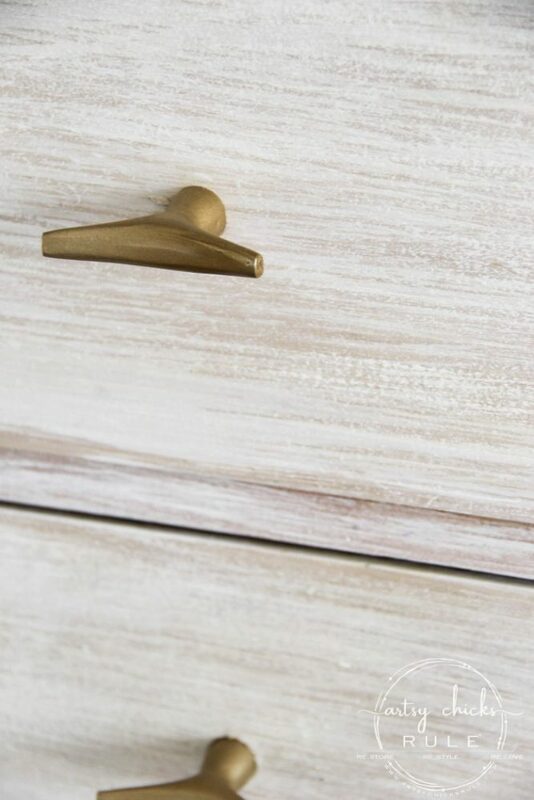 I happened to have 2 more packs of these knobs, 8, in the garage left over from when I did our buffet makeover. They came as gold but very brassy gold. For the buffet I linked above, I painted them white and turned them the other way. I wanted them long ways, side ways this time. And used this gold paint to tone them down a bit. I like that they have a nautical look. Oh well, we call that charm….or character, right. I’m pretty happy with how it turned out. I think it looks SO much better in this room, with my decor, with the updated look. 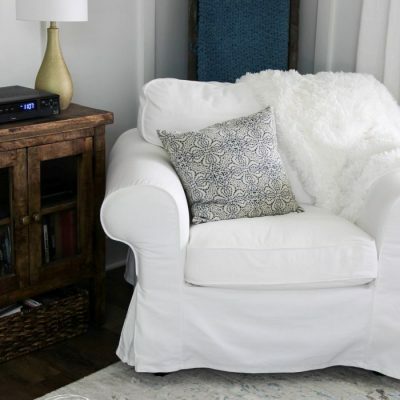 Curious about those pretty, new wood floors? You can find out all about them in this post. 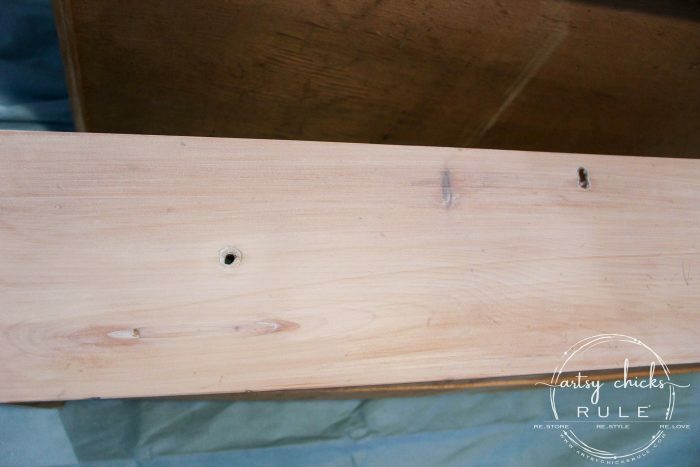 The white stain gave it sort of a washed look and even though I had to add more white, you can still see some of the wood, knots and grain underneath. I am hoping the wood doesn’t bleed on me and turn this project yellow. Even though I only completed this yesterday, I’m really enjoying the new white stain look so much better in here. I can’t wait to see what they did with all this! Have you entered the big GIVEAWAY yet?? Hop on over to this post to see what I’m giving away, and you still have a little time to enter to win! See you Thursday with a reveal!! Yippee!! We are wrapping things up around here. Next…the full dining room AND the full kitchen reveals! 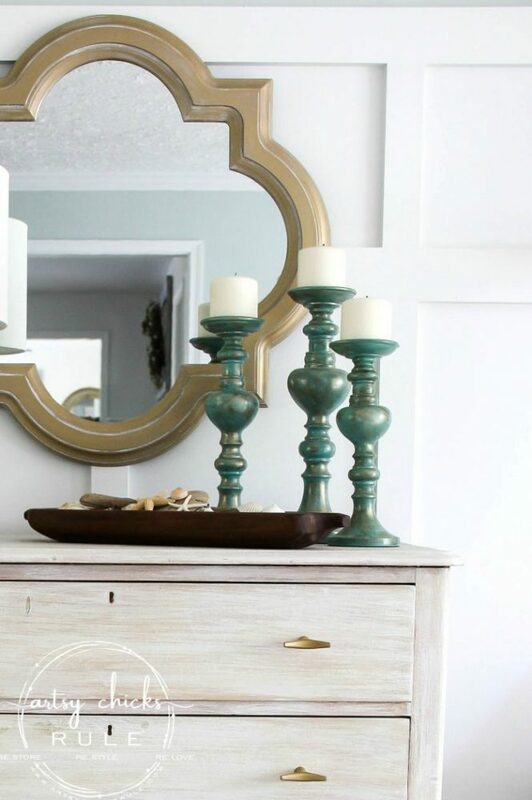 And don’t miss my newest furniture makeover (it’s my new “coffee bar”)! Beautiful makeover Nancy! 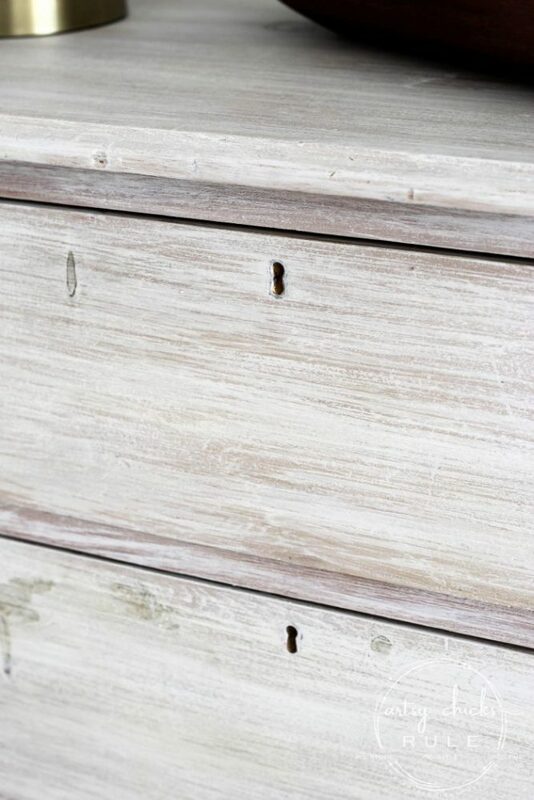 I love the whitewash look very much and the handles are perfect for a nautical look. Well done!! Wow times two!! The first redo was fun, but I adore the new look. So fresh! 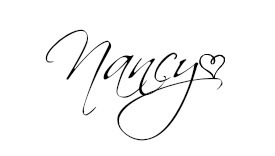 Great job, Nancy. 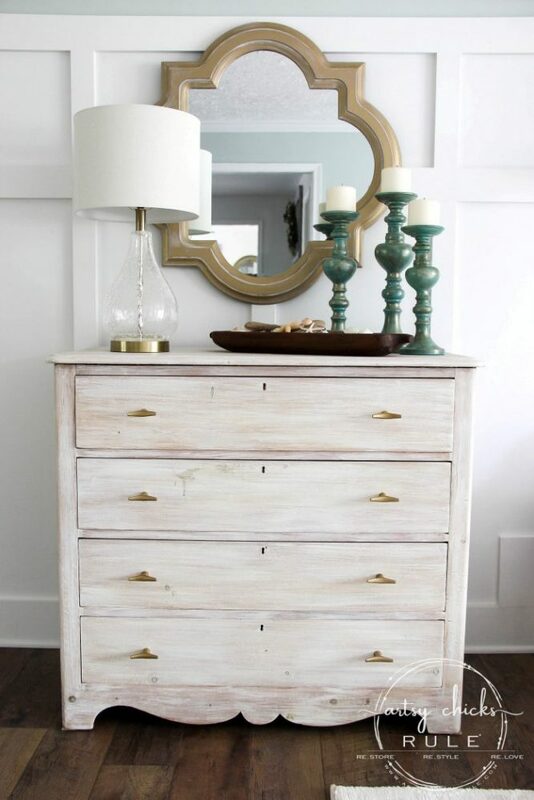 I have a pine chest too I like this look for it and my taste has lightened up through the years. 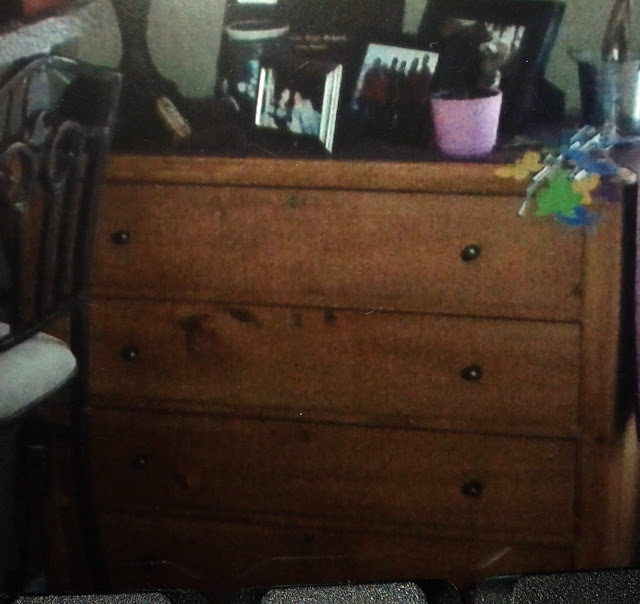 Love the dresser!! I’m obsessed with white wax!!! I really love this look! 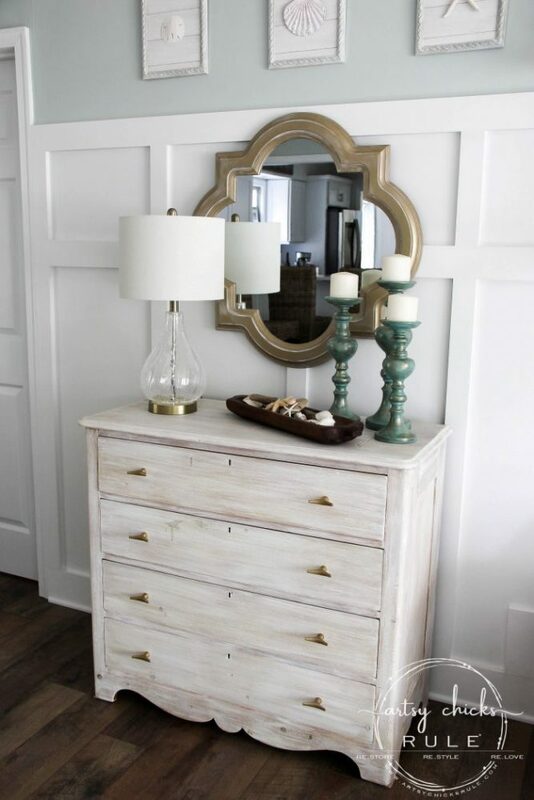 I have a similar old dresser in the garage that I would love to try this on. Anxiously awaiting to see if you get bleed through. Do you think it would have the same results if I used the clear shellac on it first? Turned out very nice, love the color scheme. So Pretty!!! I understand what you mean about a technique not always turning out the way you want and having to tweak it as you go until you get it right! That happened to me recently when I did a paint wash on my brick fireplace and also painted the wood trim around it. I thought I was only going to do the wash with watered down tan paint on the brick and same paint color on the wood but it looked very blah. 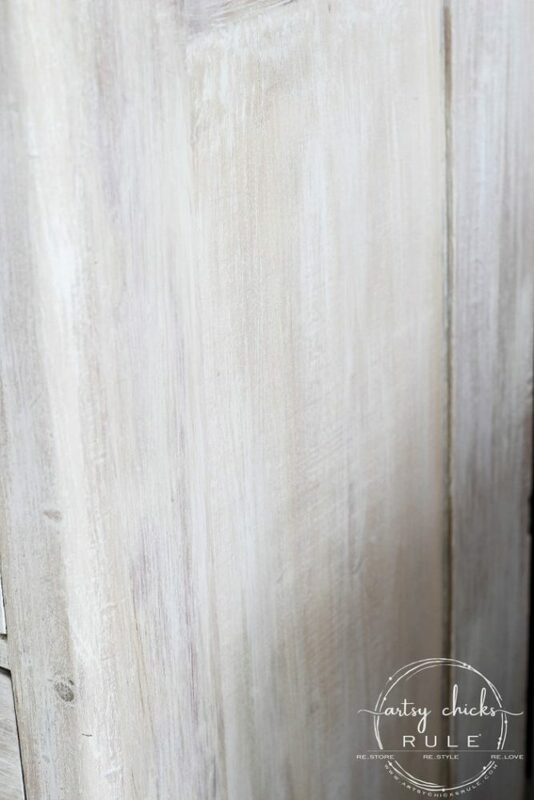 Then I had the idea to use antiquing glaze on both the bricks and painted wood that added warmth and depth, and oh my goodness! It wasn’t what I envisioned before but I like it so much better! I really enjoy your projects! 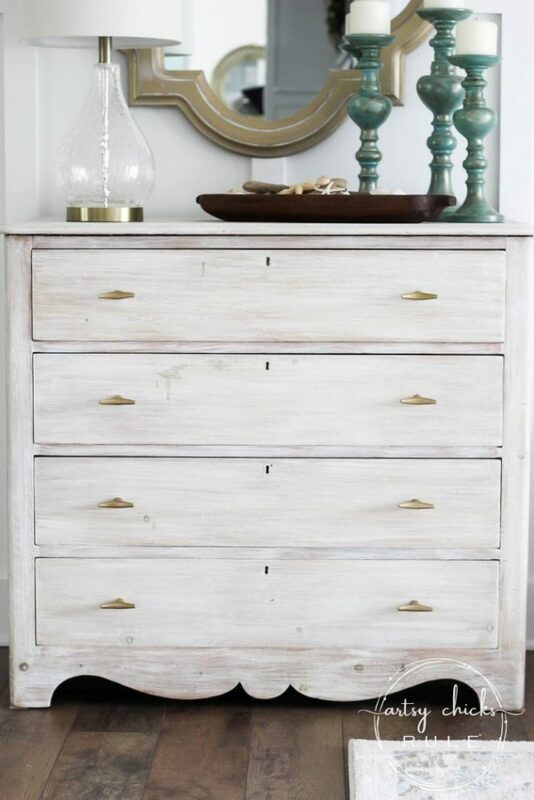 LOVE the simplicity of this piece. 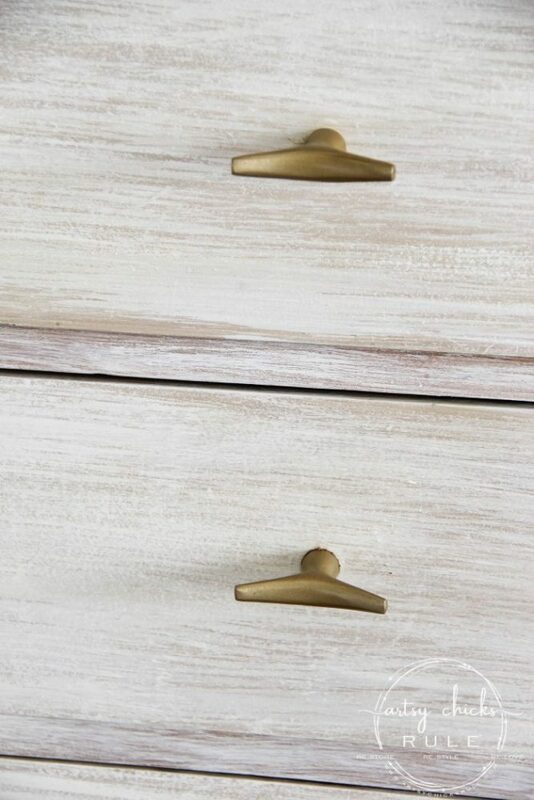 The knobs are awesome! Amazing work, as usual. 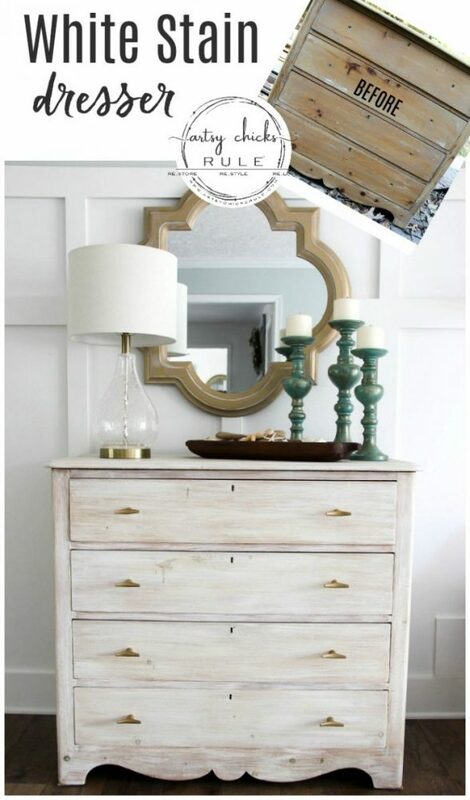 When I saw you were going to redo the beautiful Coco graphic dresser I thought “Oh no!” because I loved it so much. But, I love this lighter brighter version,too. It feels airier and happier for some reason. It’s hard to say because I really liked the Coco version but I do believe I may like this even better – and I don’t like white! Fantastic! 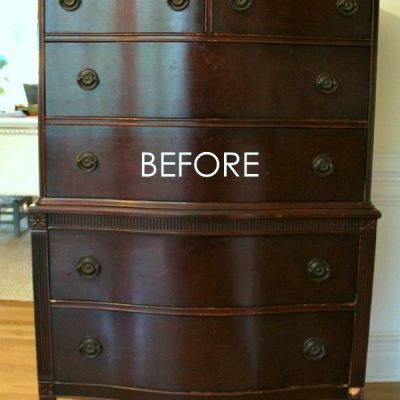 What a gorgeous transformation, even though I really loved the previous look on this cherished dresser! 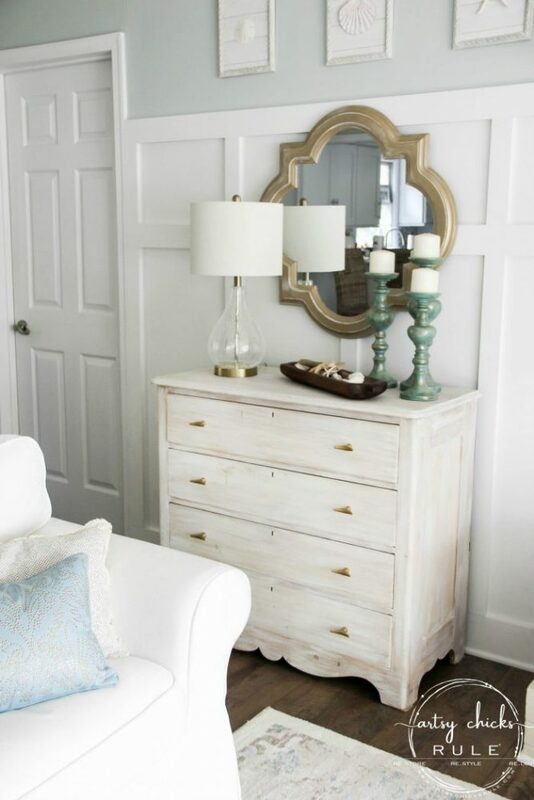 With all the other changes you’ve made in your room, this new look is sooo beautiful and perfect!